Is it me or does time go by faster now? This summer has literally just zipped by me, so quickly that it hardly feels like I've experienced even a portion of it. It might be because I didn't do much this summer, as opposed to last year where I went back to Singapore with the kids for a relaxing holiday. Yes, this summer pales in comparison. I spent most of my time working because I had to, yet I suffered horrible guilt because of it. I hated that I couldn't take the kids on a fun-filled vacation somewhere...anywhere, and before I knew it, the summer had come and gone. Now it's time for them to go back to school. Where is a time machine when you need one? On the bright side, I did try to organize little local trips as much as possible. One such trip was to Chinatown and another, taken just last week was to Huntington Dog Beach. The kids and our doggie, Daisy, had such a blast! It's a one-mile strip reserved especially for our furry friends to run off-leash and enjoy the sand and water. For those of you in the local L.A. area, be sure to check it out especially if you have a dog, are into dogs or love dog watching. See their website here for more info. I can't recommend it enough. 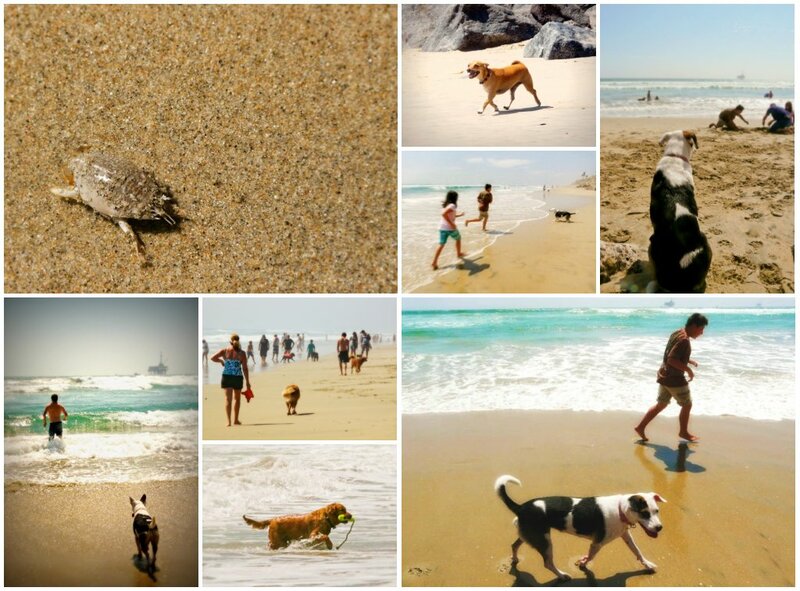 Here a some shots of our day at the dog beach. There is a combination of two condiments that I find absolutely wicked and that is the mixture of ketchup and Sriracha chili sauce. 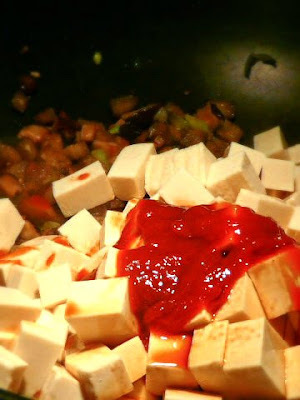 I smear it on my morning eggs, use it as a dipping sauce for french fries and as a simple sauce base for this tofu dish. 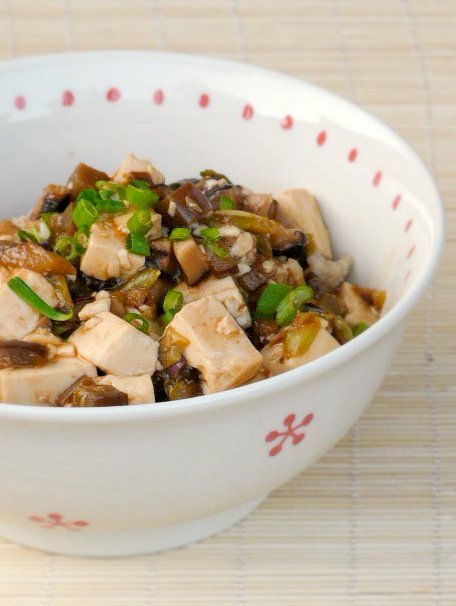 I know it sounds crazy to pair it with tofu of all things but what it does is make the dish a tad sweet and tangy, a little spicy and a whole lot of yummy. 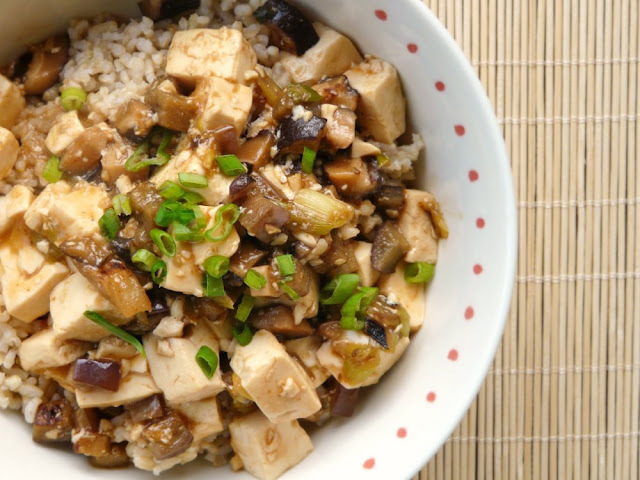 I call this my "Srirachup" tofu sauté (for lack of a better name) and it's a dish I make often, especially when I need to whip up something quick for lunch or dinner. Sometimes I add a little ground pork to it but most of the time, I make it meatless. It's always a hit with the family. hot water for about 30 minutes before cooking. Reserve a half cup of the water for cooking. 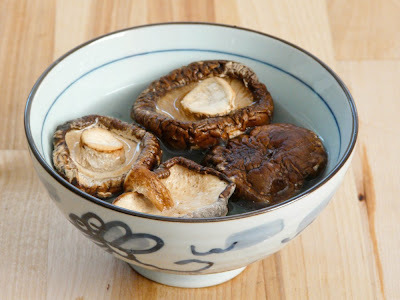 portion where there is sediment from the dried mushrooms. 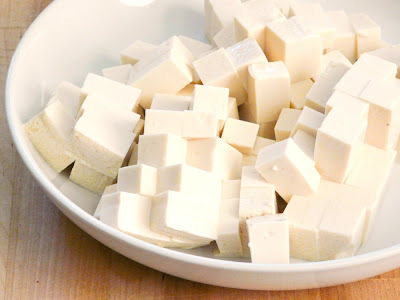 Dice the tofu into half inch cubes. green onions, separating the green and white stem portion. from burning. 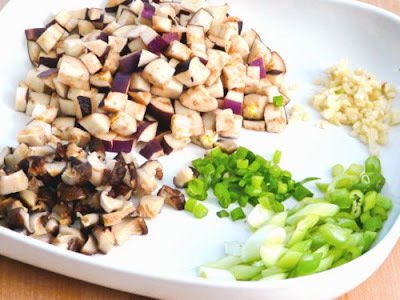 Add the mushrooms and eggplant. the eggplant has softened, about 5 mins. large serving bowl or ladle over rice bowls. I served mine over some brown rice. So satisfying! 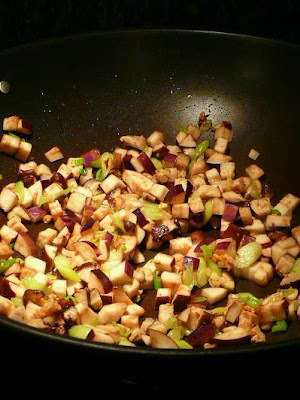 This post was linked on Midnight Maniac's Meatless Mondays (MMMM) and Hey What's For Dinner Mom's Just Another Meatless Monday. Thanks for stopping by! Hope you enjoy it! Thanks for stopping by Greenderella! Let me know how it turns out!